In February, the Yelena Shubina publishing house is releasing a new book by Pavel Basinsky called “Lev in Leo's shadow,” which chronicles Leo Tolstoy's relationships with his children – particularly with his third son, Lev. In advance of the book’s release, RBTH is publishing an excerpt where the author describes the fate of Tolstoy's second daughter, Masha. The birth of Maria Lvovna Tolstaya (1871-1906) was the cause of the first serious conflict between Leo Tolstoy and Sofia Tolstaya. While breastfeeding one-year-old Lyovushka, Tolstoy's wife realized she was pregnant again, which she was not pleased about. She was tired of giving birth and breastfeeding; she was tired of feeling like a breeding animal rather than a woman. She then suffered from childbed fever after Masha’s premature birth, nearly dying. The doctors advised her against having any more children, but her husband was categorically opposed to this idea: he could not conceive of a married life without the birth of children, which nearly led to their divorce. In his book “Tolstoy’s Children,” Sergei Mikhaylovich Tolstoy writes that Masha’s childhood “passed unnoticed in the noisy crowd of older siblings: Sergei, Tatyana, Ilya and Lev, who treated her like Cinderella, leaving her all the most difficult chores.” This childhood taught her not to dodge hard work. Half-jokingly, half-seriously, people would say that Masha was suffering from a mental disorder encapsulated in the English phrase “as you like it.” In other words, you always do what other people want from you, rather than what you yourself want. Maria followed Tolstoy everywhere like a shadow from a very young age. As a teenager she shared all his new views, renouncing her social life and becoming a strict vegetarian. 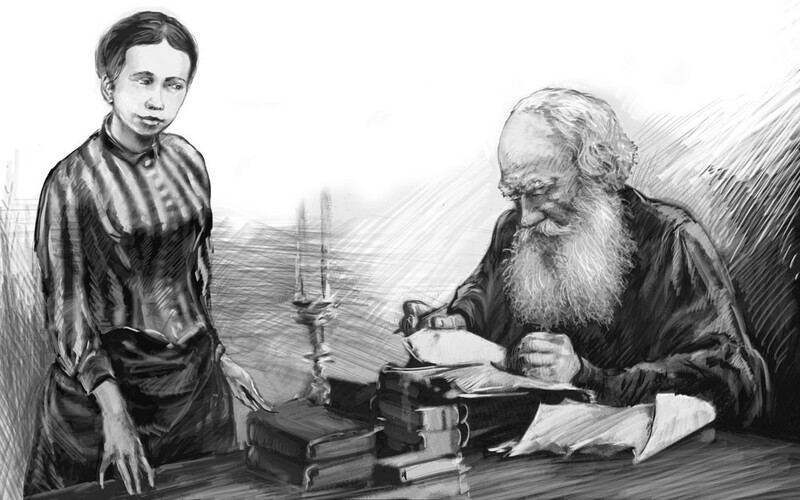 She transcribed Tolstoy’s texts and managed his correspondence, serving as a link in all practical matters with his pupil and publisher, Vladimir Grigoryevich Chertkov. She often came into conflict with Chertkov, however, out of jealousy towards her father’s close relationship with him. For her part, Tolstoy's oldest daughter, Tatyana, was jealous of her father's close relationship with Maria. Masha was the only grown-up child with whom Tolstoy could be sentimental, allowing her to be sentimental with him too. Lev Nikolayevich was never tender with his other children. This was largely due to Masha's nature: she was always sympathetic, cheerful, and always ready to help. The peasants adored her. Indeed, there was probably not a single person who would not have been charmed by her; she may not have been outwardly beautiful, but she had an incredibly beautiful soul. Although she had given up social life, Masha did not renounce all of life’s joys; she sang and danced with her family and the peasants, and took part in amateur theater productions at Yasnaya Polyana. And yet... her story was similar to Tatyana’s. No matter how hard she tried to renounce her feminine nature for the sake of serving her father and ordinary people, nature prevailed. Her first love interest was Pavel Ivanovich Biryukov, a follower of her father and exceptional person who was much loved by the Tolstoy family. They seemed to be heading quickly towards a marriage that many people were certain would happen. However, Tolstoy refused Biryukov and talked his daughter out of marrying him. We can safely assume that he was afraid of losing a valuable assistant. In 1906 Masha died of pneumonia at the age of 35. She died in her father’s arms, who did not leave her bedside. Pavel Basinsky is a Tolstoy scholar and the author of several bestselling biographies, including “Leo Tolstoy: Flight from Paradise,” which won the Big Book Prize.